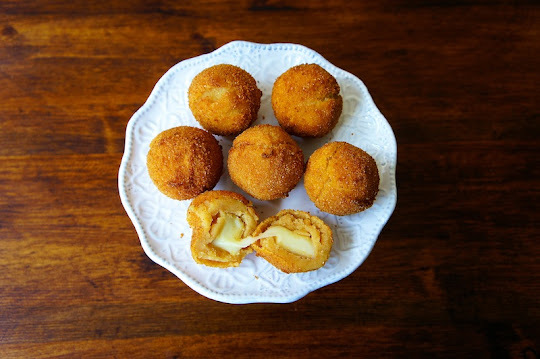 I like to treat my kids with these Fried Potato Cheese Balls every now and then. It's made with mashed potatoes, taco seasoning, and I filled it with mozzarella cheese. Just fry the potato balls in moderate heat until the potato balls crack, that's when the cheese has melted, and the potatoes should be golden brown. You can prepare the potato cheese balls ahead of time, as it only takes a minute or so to fry them. Although, it taste just as good on it's own, I like to prepare some Guacamole on the side as a dip. Try it. Put the potatoes in a large saucepan and covers with water. Bring the water to a boil, and cook potatoes for about 10 to 15 minutes, until cooked through and drain. Mashed the potatoes and season with taco seasoning, set aside to cool. Divide the mashed potatoes into 16 balls. Press the center of each ball and filled with diced cheese. Then wrap the potato around the cheese and continue with the rest of the potato and cheese. Roll the potato balls into the breadcrumbs; dip into the eggs, and then into the breadcrumbs again. Fry the potato balls in batches over moderate heat until golden brown in color. The potato balls will cook in a minute. Dish out with a slotted spoon and drain on a paper towel. Serve the potato balls with guacamole.